Singleton Corporation has created an exclusive line of immersion test tanks. These series of tanks can be for water immersion, salt solution immersion or other electrolyte solution testing. All tanks meet the ASTM D870 specifications. This includes water immersion testing as well as other test specifications that are alike. Long lasting performance and structural integrity is assured through the use of Fuse-Fab® fusion welded polypropylene. 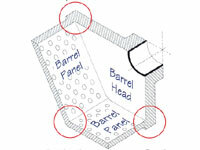 A removable cover is provided to protect the solution from contamination when not in use. Singleton tanks are made with premium grade, high temperature polypropylene construction assuring quality and durability. Fuse-Fab® constructionjoins sections of plastic material, in a controlled thermal process, creating a single uniform cross-section. This provides a positive effect of a seamless tank with incredible strength and integrity. The unique Steel-Core® construction eliminates parts loss and warping while enhancing overall durability. Tank rim, supports and side ribs are available with the Steel-Core®. Each Singleton processing tank is provided with superior strength and extended service life through the reinforcement of the encapsulated Steel-Core® tecnology. CCT - Cyclic Corrsion Testing Chamber. Handles up to 16 pre-programmed tests. SCCH - Salt Fog Test Chamber. Sizes are available ranging from 9.3 cubic feet to 2,508 cubic feet.